I kept the Aquash brush pens separate as I think they’re in a class of their own. So! Brush pens. 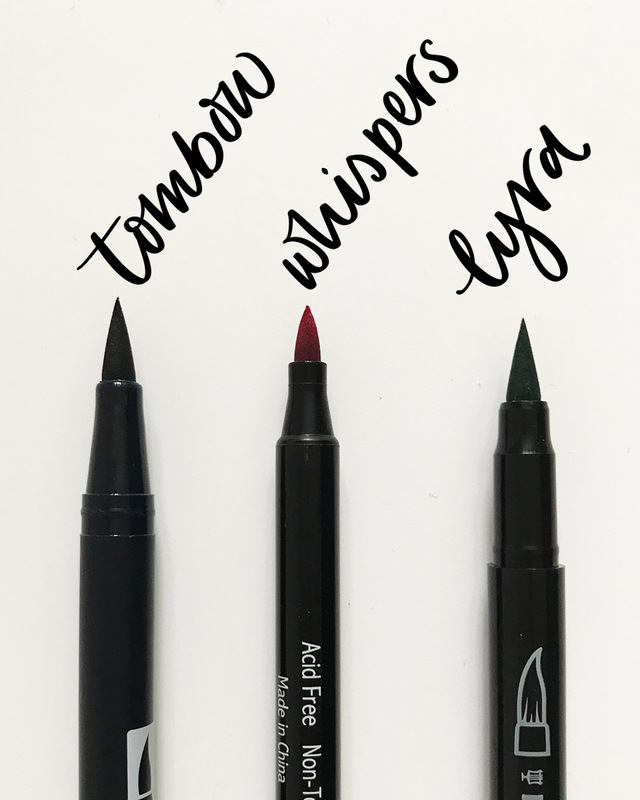 Here I have 3 of the felt-tip type ones I have and use regularly. Well, that’s a little bit of a fib - I use the Tombows 99% of the time and then play around with the others if I don’t have a Tombow up to the job (they've all run out of ink or got fluffy, etc). They are just the king of brush pens. The nib is a perfect flexibility, the ink has a lovely opacity (the gradients you get with lighter colours are beautiful). The only problem I find is that if you use less than super-smooth paper the nib gets fluffy and useless very quickly which is frustrating. The Whispers brush pens are an odd one. Mainly because I have NO IDEA where I got them. All I know is that I came across a massive set when I was at uni. I love them. So much. BUT the nib is quite small and they don’t last very long. I’ve scoured the internet for them but have come to the conclusion that they’re no longer made. I even contacted a big pen retailer to ask them to track them down but they couldn't find any trace of them. So you’re out of luck with those! The Lyra pens are decent. I bought them in a bid to find a cheaper alternative to Tombows. They work fine, the colours are good, etc, but the tip is just a bit too firm and plastic-y for me. For me this means my curves aren’t always looking their best. In conclusion: buy Tombow Dual Brush pens. They really are the best ones and I’ve now been using them for over a decade, five years of that for lettering.